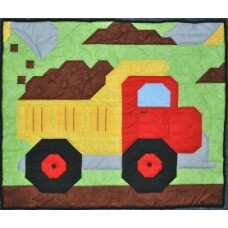 This bright and adorable Dump Truck is a great baby blanket for any construction theme room. * 3 sizes: Wall 24"x28", Crib 36"x42, and Lap 48"x56"
With the multiple sizes this quilt is a great one for baby, or big brother. Just add borders and make it a twin. The pattern lists fabric yardage, then uses tables to show the number of strips to cut and the number of pieces to cut from those strips. The entire top is then sewn using straight 1/4" seams. The rounding is done with triangle overlays. I have some instructional videos on youtube and my facebook page. Just search Counted Quilts. ~~To download the pattern once the transaction has gone through, simply go to My Account > Downloads.